Scratch for Arduino is a Scratch modification that allows program Arduino platform on a simple way, using a high level interface. 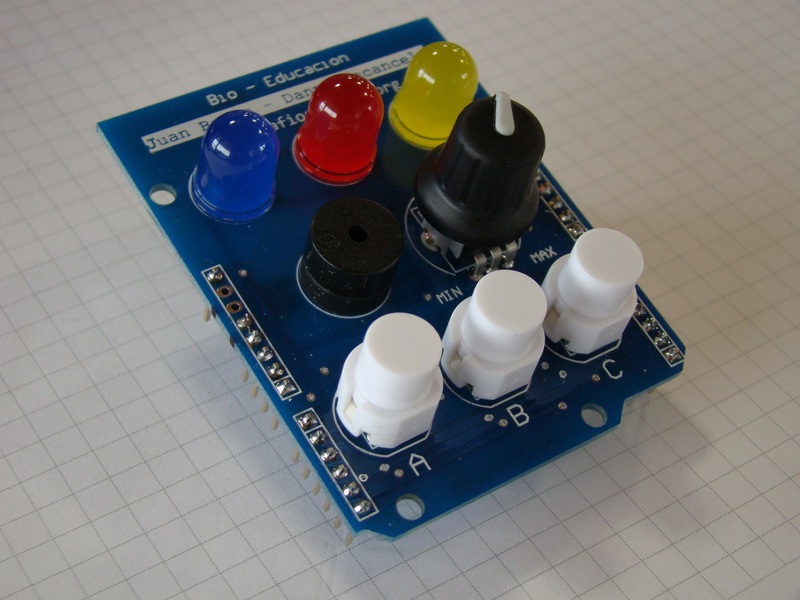 It includes specific blocks for managing sensors and actuators connected to Arduino board. In the project webpage you can find all the info and resourcers to start working with it. Four special outputs to connect continuous rotation servomotors: Digital pins 4, 7, 8 and 12. 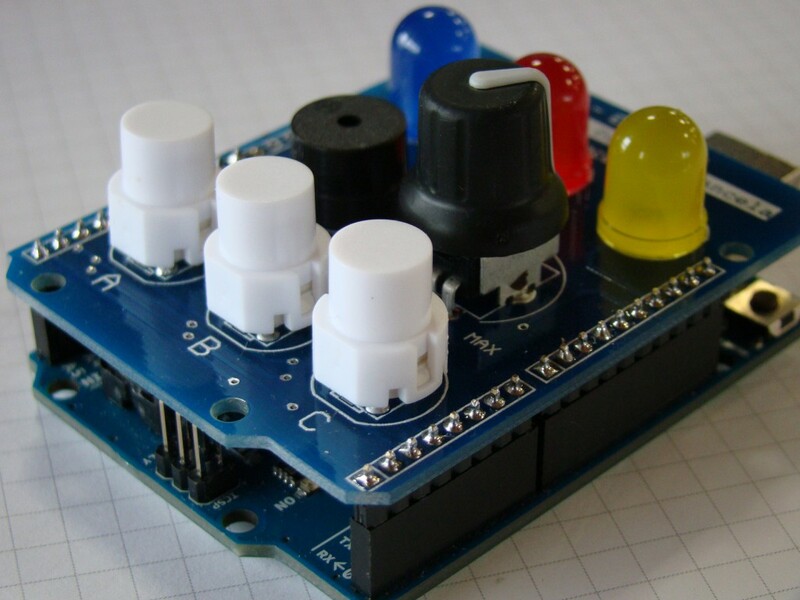 To use this mod of Scratch with Arduino, first you must install Arduino environment (including drivers) and upload to the board the firmware that allows the communication between Scratch and the board. Once you make this steps, you will have the system ready to start working with S4A! The K4S board is oriented for a educational environment, so the hardware is ‘simple’, and has the basic elements to start working with S4A. I develop this breakout board to fit in the Arduino Uno board. Why Arduino Uno? Because from S4A ensures that with this board they test the software and works. I’m working with this board about three months and always works fine! Here you can find the schematic of the board. 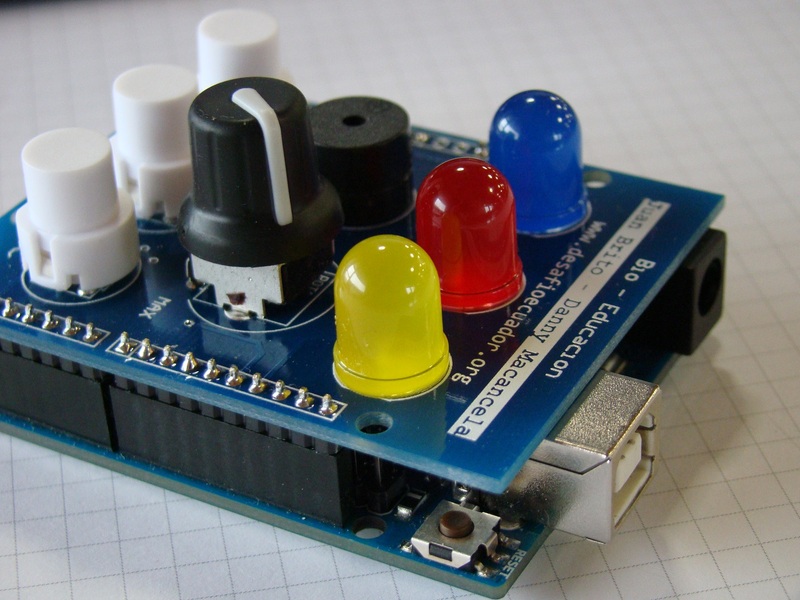 The left one (blue led in the below image) is connected to the analog output 9 (PWM). 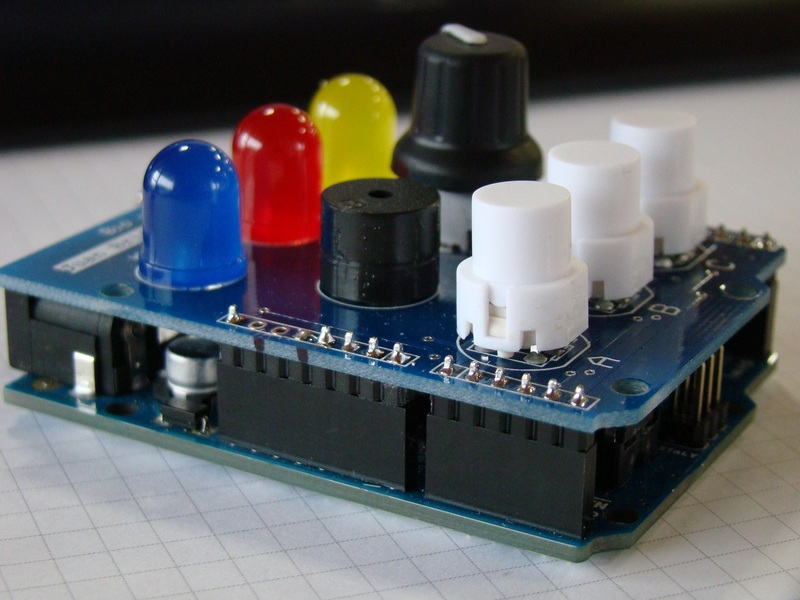 This allows to vary the intensity of the led, in function of the output value (PWM outputs are not ON/OFF outputs. It values can vary from 0 to 255, so in function of the used value, the led brights more or less). The middle led (red one) is connected to the digital output 10. Here, only ON/OFF states are allowed. The right led (yellow one) is connected to the digital output 11. Here, same as red one, only ON/OFF states are allowed. The buzzer is connected to the digital output 13, through a digital MOSFET transistor (FDV301N) to activate it. The potentiometer is connected to the analog input 5, and allows send to Scratch analog values from 0 to 1023. ‘A‘ button can be connected to digital input 2 or to analog input A0. Actually is configured to read as digital input. ‘B‘ button can be connected to digital input 3 or to analog input A1. Actually is configured to read as digital input. ‘C‘ button can be connected to special digital output 4 or to analog input A2. Actually is configured to read as analog input, because digital 4 is set as output. If in the future this output can change into an input, then the pushbutton will be read as a digital input. 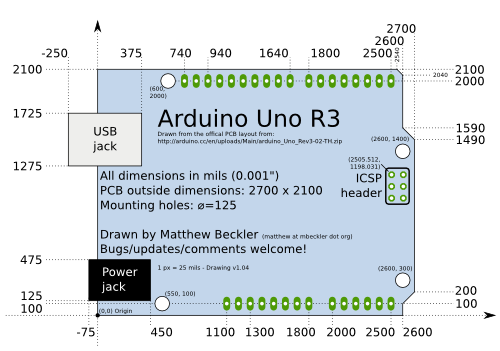 The board is designed to fit in the Arduino UNO board. After googling some time looking for the outline Arduino UNO board compatible with Altium Designer and don’t find it, I decide to make my own board using the dimmensions I find here. As a result, here is the board in Protel format, to open with Protel 2.71 / Protel 99 / Altium Designer. The design of the board was easy, I use Top layer to actuators and indicator components and Bottom layer for the rest of the components. I use 1206 parts because space is not a problem and are easy to solder by hand. Again, I use the Seeed Studio PCB Fusion service to order the boards, in blue color this time!. They’ve the 100% E-Test at free of charge, a plus to continue working with they. In the design of the board, I make two errors. One is trivial, the silkscreen of the led’s is wrong, the cathode mark is on the anode, so the led’s must be mounted as contrary as the board indicates. The other error is important, but with a easy solution. I change the pins on the power connector in the Arduino board (J1 connector on the scheme). This means that IOREF and RESET pins are connected to Ground and 3V3 voltage of the Arduino board is carried to the 5V of the keyboard power. Fortunately, it’s easy to solve. In the J1 connector, you don’t mount pins 2, 3 and 4 and make a bridge between pins 5 and 4 to carry the 5V power supply. It’s a silly fail and I just correct in the PCB for future versions. After make this changes, the last step is make a simple program to test all the functionality of the board. Here you can download the code for the test of the board: K4S_DEMO. When you press the ‘C’ button, the buzzer sounds for around 300mS and then stops. The red led brights in function of the position of the knob. When the knob is on the ‘MIN’ position, the red led is off. And when is in the ‘MAX’ position, the red led lights at the maximum. Finally, a short video where you can see the board in action! Hi, I liked your idea and would like to implement it myself. Could you please tell me the ,list of parts you used to build the keyboard. Hi! Thanks for your interest in the board! If you see the schematic, you can find the components I use. For your reference: resistors and capacitors are 1206. Transistor is FDV301N. Led’s are 10mm diameter (I buy in eBay). 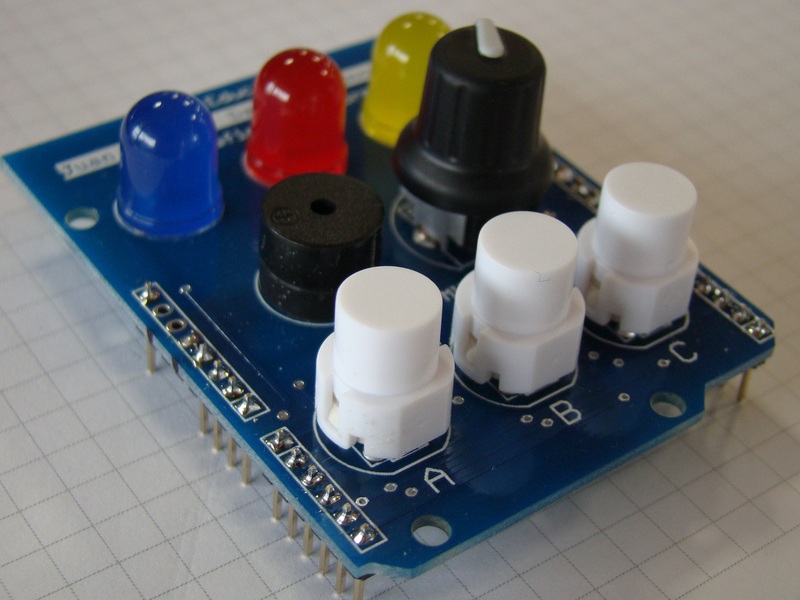 Buzzer is 5V and 12mm diameter (also buy in eBay). 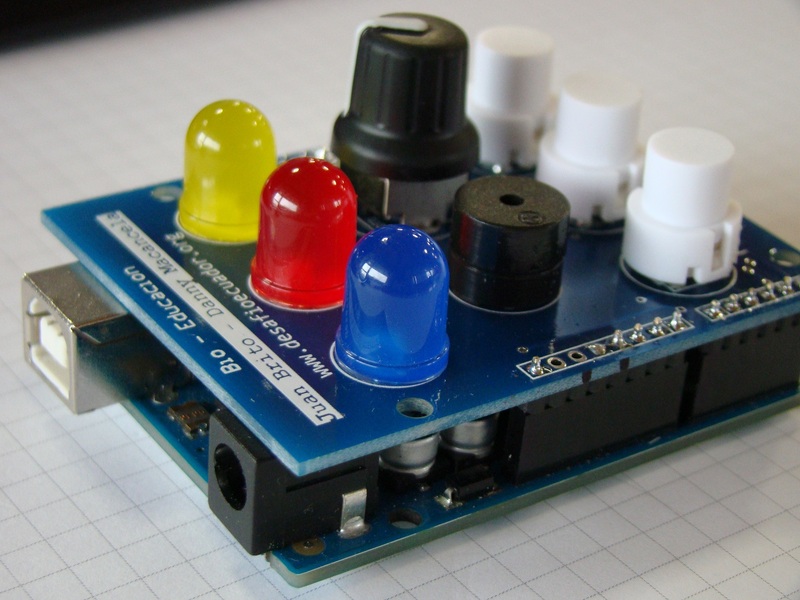 Potentiometer: http://es.mouser.com/Search/ProductDetail.aspx?R=PTV09A-4015F-B103virtualkey65210000virtualkey652-PTV09A-4015FB103 and Knob: http://es.mouser.com/Search/ProductDetail.aspx?R=450-BA761virtualkey56100000virtualkey450-BA761 . 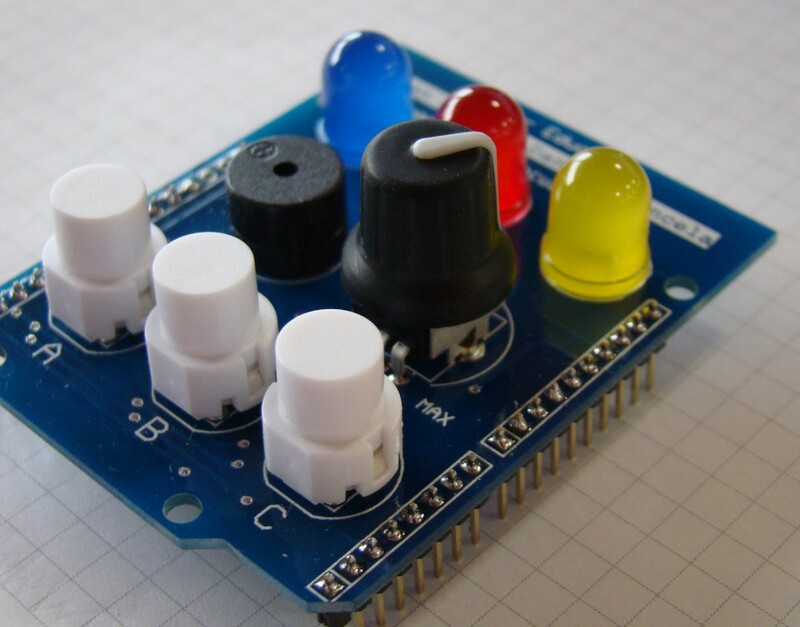 And finally, the pushbuttons: http://es.mouser.com/Search/ProductDetail.aspx?R=D6R00_F1_LFSvirtualkey61170000virtualkey611-D6R00F1LFS . Hope this info will helpful for you. And if have any other question, please tell me! 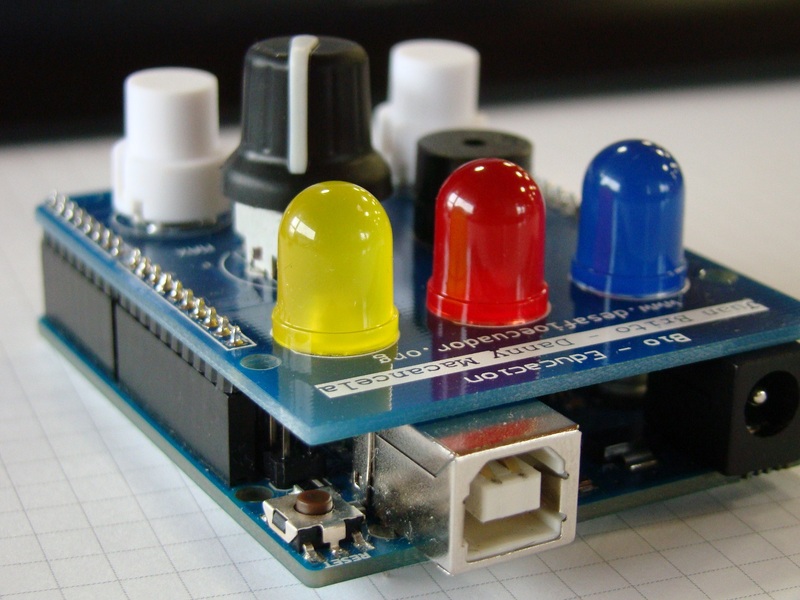 Hi I just want to add I am a newbie at arduino. I liked your keyboard and am not so good with electronics and reading electronic schematic diagrams. 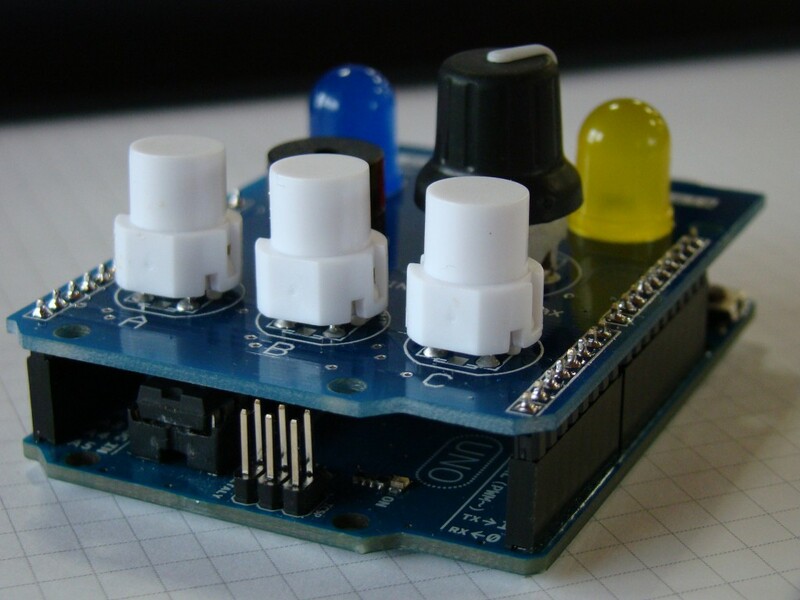 I have successfully completed many arduino projects but have followed the fritzing layouts. 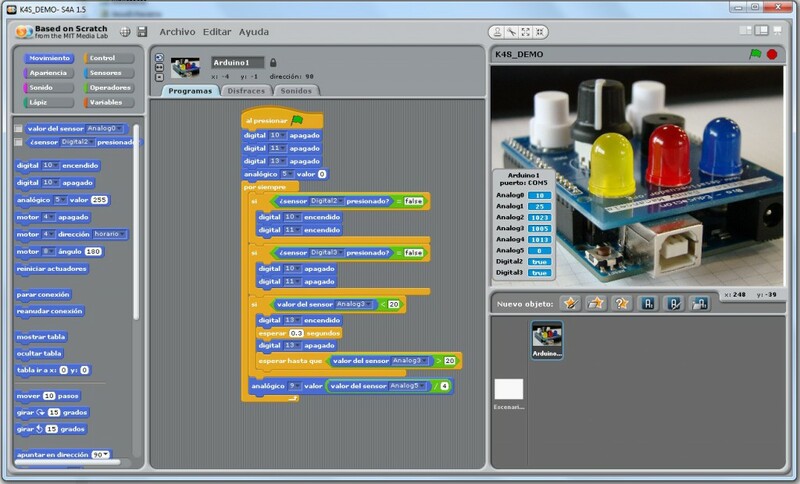 I teach school children scratch and scratch with arduino. I think it is superb, the learning possibilities are endless. Hi! That’s the idea of this board, bring close the technology to children on a easy way in places where access to the technology are difficult. At this time, I’ve a few boards in stock, maybe if you are interested I can sell you one of it, mounted and ready to use. 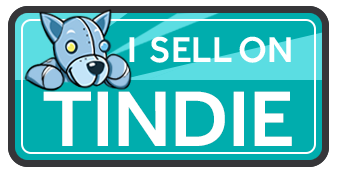 If you want more info, please send me a email and we can talk about it. Thanks again for your interest in the board!! I’ll use my UNO this summer to teach my children. I find your ideas are very awesome. 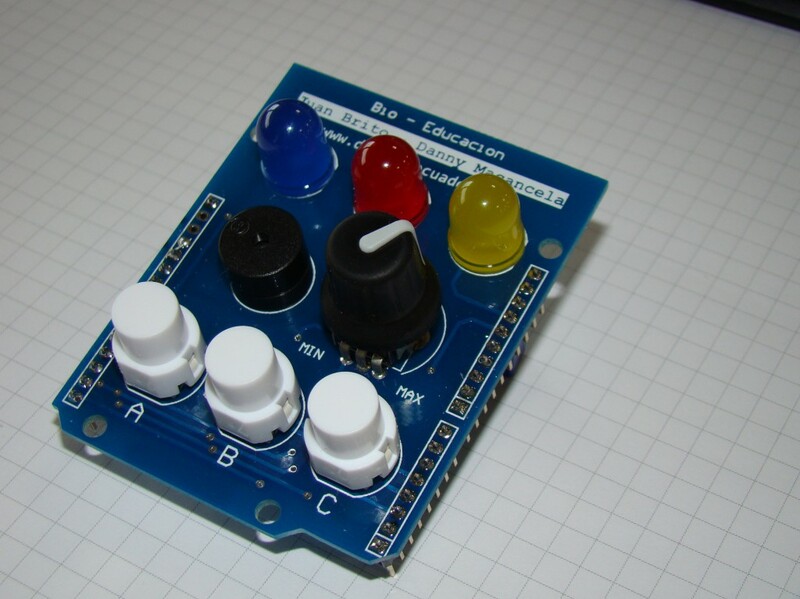 So, I’ve decided to build my own version, maybe with some mods: I could connect more leds if I use multiplexing and/or charlieplexing, and I could connect more push buttons the same way (using one or two analogs inputs along with them). Whatever I finally do, It seems surprising to me that you are ordering your boards to SeedStudio. I wonder how much can be the price, as no info is given directly on the pages. Other similar services that I have found before have a cost quite higher than I expected. I’ve always build my boards at home. I usually need no more than one. Even with my secondary pupils, we have etched our own boards in the workshop -I find it interesting and fun-. Should I change my mind on that matter? Thanks for your comment and sorry for the late in the answer, these days are holidays in Spain and I was out. About your question: for me, in theses days, prices of manufacturing PCB’s are very low, and I always prefer to send out. Etched boards are good for teach the process, and you need the materials, tools and a good place to make the process. It’s a good method to make ‘fast’ prototypes, but in small quantities, at the end you’re making every board manually. I used Seeedstudio (and other manufacturers) to do this work, because quality is very high for the prototypes and the price isn’t high. In this web: http://www.seeedstudio.com/service/index.php?r=site/pcbService from Seeedstudio, you can configure your board and have a quote. 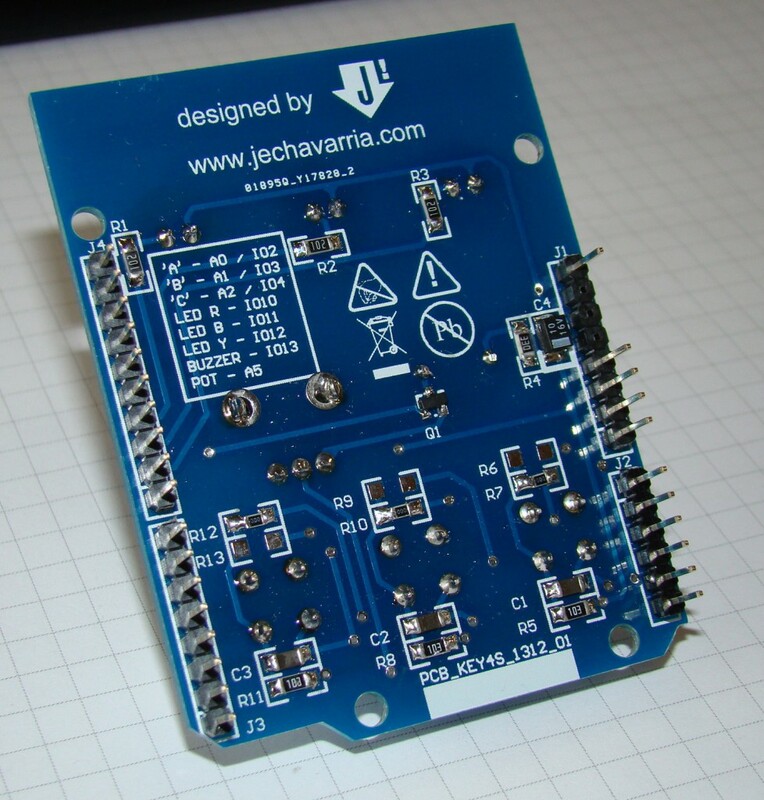 For example, an arduino shield will cost 20,90$ + shipping costs for 5 boards with green solder. If you order 10 boards, then the price will be 24,90$ + shipping for the 10 boards (2.49$ each board!). As I tell you, I think this price is not very high. In my next project, I’ll use another web to test it, and the prices are cheaper: http://dirtypcbs.com/ . In this place, 10 boards with a maximum dimmensions of 10 x 10 cm will be cost 25$, any colour and including shipping costs. In my case, for these prices, I prefer order the boards rather than manufacturing myself. If you want more info or continuing with this conversation in Spanish, please send me a mail to the address: jesech1978@hotmail.com. Also, at this time, I’ve two boards mounted, tested and ready to send it. If you’re interesting, please also tell me!. Thanks for your comment and I hope help you in your question!! Holidays? What hollidays? I must be living in another Spain. Well, I’ve choosen English after a look to the “less” populated spanish section. If we need to move other people to conversation, I think it will be more usefull here. Yes, I see, indeed, the cost of those services is really afordable, and maybe I’ll use them when I’m in need of five or ten. Thanks for your comment Roshni! If you want more info about the board, or something whit I can help you, just tell me!